Hyperthyroidism is a condition in which the thyroid gland produces too much thyroid hormone. Tapazole works to suppress the amount of thyroid hormone produced. 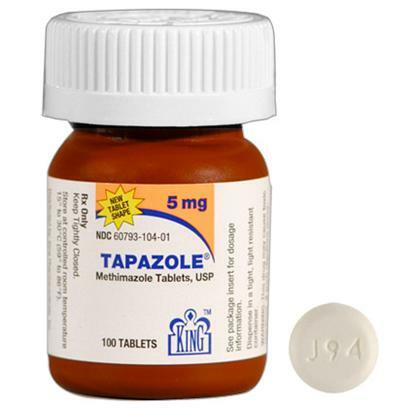 In some instances, Tapazole is prescribed as a preparatory treatment for thyroid surgery or radioactive iodine therapy. This drug can also be used to treat Graves Disease. If your cat suffers from hyperthyroidism, speak with your veterinarian today. After performing blood tests to determine the proper dosage for your pet, your veterinarian can prescribe Tapazole. Routine blood work will need to be performed. For more information, speak with your veterinarian or pharmacist. An effective and affordable generic alternative to Tapazole is Methimazole. Side effects are extremely rare (under 5%) but can be dangerous. Contact a veterinarian if your pet exhibits a sore throat or excessive bleeding. Liver failure has also been reported in rare cases. Other side effects include lack of appetite, vomiting, rash, hives, itching, edema and drowsiness. Give this medication as prescribed by your pet's veterinarian. This drug can be given with or without food, but be sure to allow your cat plenty of drinking water.